Could there be anything better? 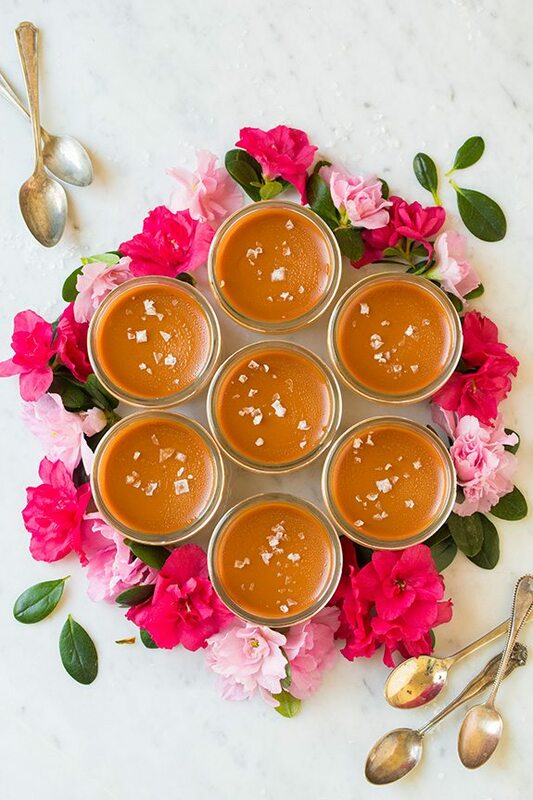 These Salted Caramel Pots de Creme are evereeeeything!! I’m mean I expected these to be good because they are made of all the good stuff, but they even exceeded my expectations! They were so dreamy and then some! Could I add any more exclamation points??!! I really, really love these. 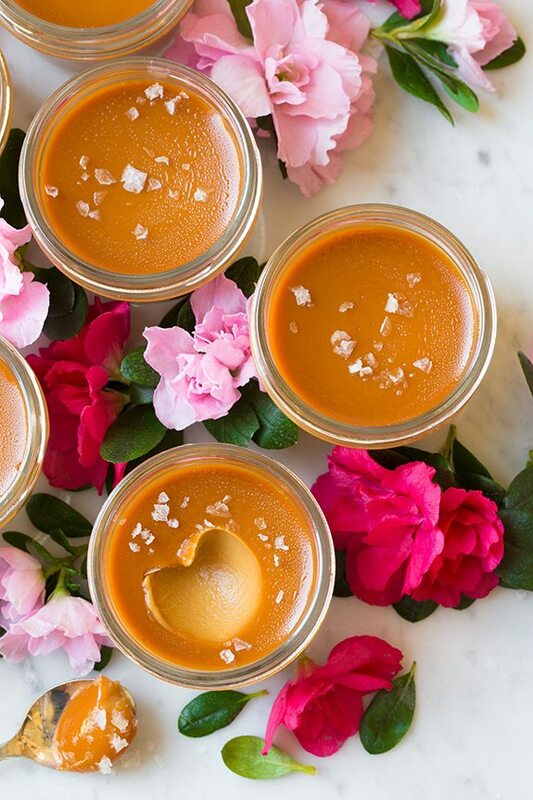 If you like salted caramel you will love these too. I mean really what’s not to love here? Preheat oven to 325 degrees. 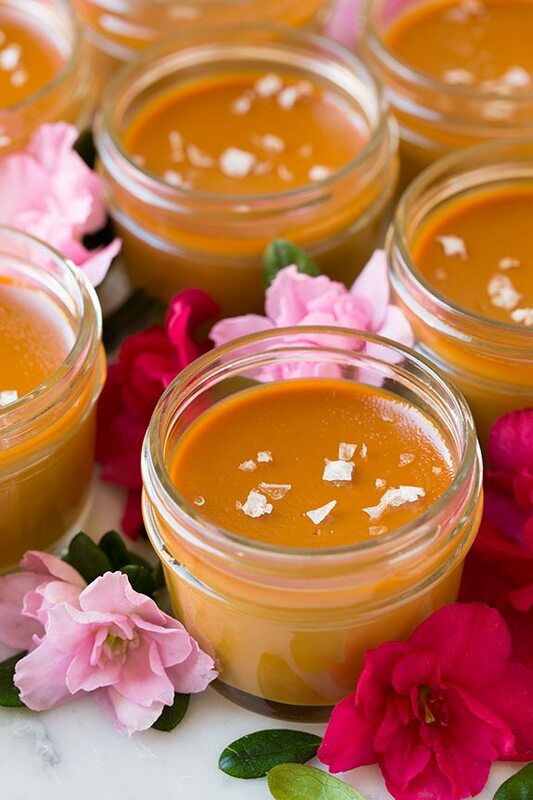 Place seven 4-ounce oven proof jars, ramekins, or custard cups in a large roasting pan, set aside. 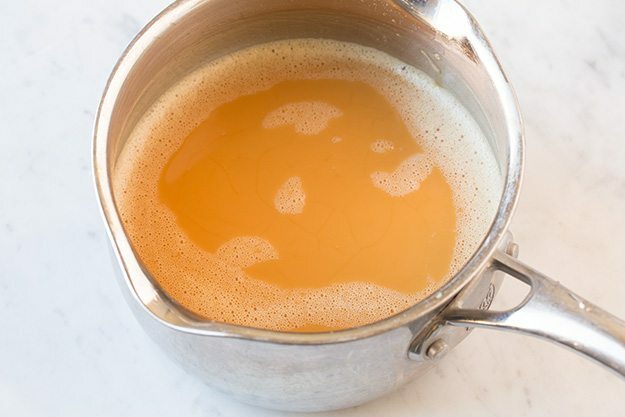 In a medium heavy bottomed saucepan combine sugar, water and 1/4 tsp salt (have heavy cream ready so you can immediately add it when caramel is ready, otherwise it will burn. Also I recommend working with a long handled whisk here since the mixture will steam and sputter). Whisk over medium-low heat stirring constantly until sugar has dissolved. Increase heat to medium-high heat and bring to a boil. 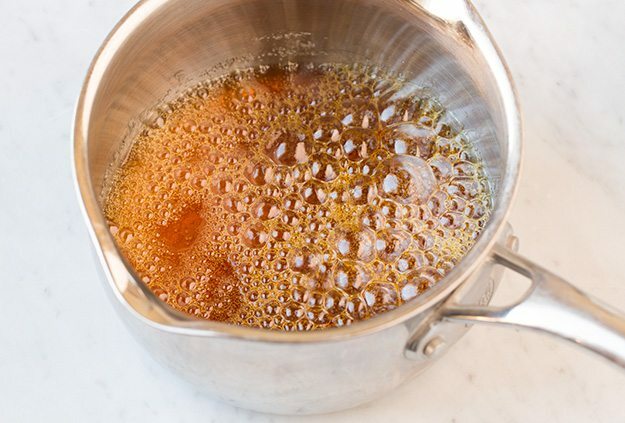 Allow to boil, without stirring and using a pastry brush dipped in water as needed to brush down sugar crystals on sides of pan, until mixture turns an amber color, about 8 – 10 minutes. 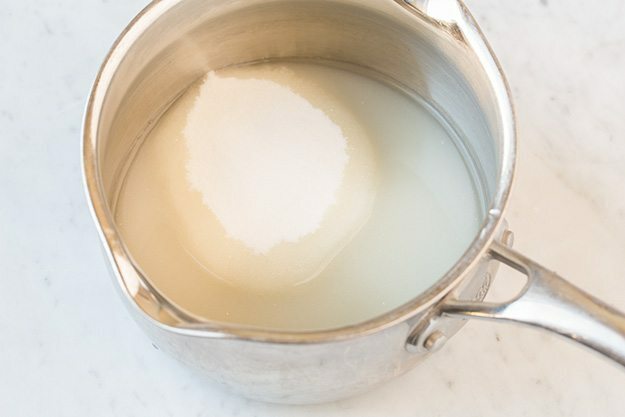 Once it reaches that color (immediately) carefully pour in heavy cream and milk while whisking (it will bubble vigorously and likely clump onto the whisk but will dissolve once returned to heat). Return to heat and cook, while constantly whisking, about 2 minutes longer or until sugar has dissolved. Remove from heat, stir in vanilla and let cool several minutes. In a large bowl stir egg yolks just to blend. Slowly pour cream mixture, while whisking, into egg yolks. Pour mixture through a fine-mesh sieve into a 4-cup glass liquid measuring cup with a pouring spout (if there are any bubbles/foam at the top of the mixture just press a piece of plastic over them to remove them as they’ll stick to the plastic. It will give a pretty presentation in the end not to have the bubbles). Divide mixture evenly among cups in roasting pan. Pour enough hot water into roasting pan around cups to come halfway up the sides of the cups. Carefully place on oven rack in center of oven. Bake until custard edges are set but center still jiggles slightly when shaken, about 40 minutes. Transfer cups to a wire rack and cool 30 minutes, then transfer to refrigerator and chill 4 hours. Sprinkle with Maldon just before serving. *I don’t usually keep whole milk on hand so I simply replaced 1 Tbsp of the 1% milk I do have with 1 Tbsp heavy cream.